The Bear Mountain 30 Hybrid Electric Launch is designed for low-speed cruising while using the least amount of fossil fuel possible. It normally runs on batteries charged by solar panels and shore power. When necessary, a diesel generator powers its electric motor and charges its batteries. Left—Joan Barrett loads provisions in Smiths Falls, Ontario, for the next leg of their cruise on the Rideau Canal. The side curtains provide a good measure of protection in bad weather and are easily removed and stowed on nice days. Right—Joan pushes off the stern while Mary (right) and Lucie, Ted and Joan’s faithful traveling companion, get comfortable in the open aft lounge. The narrow displacement hull is more canoe- like than the average family cruiser. It was designed by Steve Killing, a master of efficient small boat design long associated with Bear Mountain Boats. The launch will comfortably accommodate a couple for several weeks of inland cruising. There is a small berth under the forward deck. The cabin, or pilot house, encloses the steering station, galley and head. The aft half of the boat is an open lounge seating area that can comfortably accommodate up to six passengers for day trips and can be enclosed with canvas panels when the weather dictates. 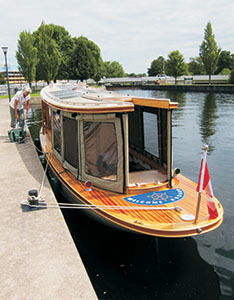 Following the launch, Ted and partner Joan Barrett took Sparks on a 12-week, 674 mile shakedown cruise from their hometown of Peterborough, Ontario, through the Trent Canal to Clayton, New York, and then north via the Rideau Canal to Ottawa. While in Clayton they displayed Sparks at the Clayton Marine Museum Antique and Classic Boat Show, where it won the Best Contemporary Boat Award. It’s easy to see why this 30′ fantail launch is so appealing. Left—Looking forward, the cabin/pilot house contains a berth under the deck, a galley, head and the steering station. Right—Joan and Ted check the indispensable Canal Guide to help pick the next stopping point on their way to Ottawa. 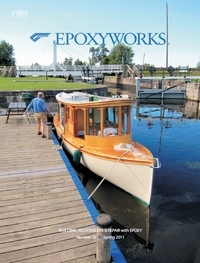 It borrows the classic lines and character of steam launches that plied these canals generations ago, but at the same time it represents everything Ted Moores has learned about modern composite boatbuilding over the last thirty-five years. I couldn’t wait to see it. 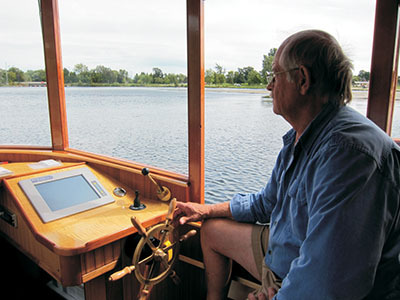 While on vacation last August (2010), my wife Mary and I were fortunate to catch up with Ted and Joan in Smiths Falls, Ontario, for an afternoon cruise on the Rideau Canal. Smiths Falls is about midway between Kingston and Ottawa, lock number 29a on the canal. After dropping off a vehicle at the Kilmarnock Lock, number 24, about 20 minutes away by car, we boarded Sparks. It’s immediately obvious why she won a Best Contemporary Boat Award and why Joan called the launch “Ted’s Jewel Box.” There are few straight lines in this boat. Those classic lines require a lot of laminating, a lot of hard work. Ted is a perfectionist when it comes to brightwork and there is a lot of brightwork. The joinery and the finish are flawless. You will notice a predominance of white cedar planking and book matched curly maple veneer accented with black cherry and walnut trim. Most of the planking and veneer was vacuum bagged over plywood fiberglassed on both sides. All of the brightwork is assembled and coated with WESTS* SYSTEM® 105 Epoxy resin/207 Special Clear Hardener® and varnished with Pettit Easpoxy™ Hi-build 2056. Left—The white cedar paneling on either side of the aft stairs is trimmed with cherry. Right—Ted also used Cherry to trim the book-matched curly maple door to the head. The first leg of our afternoon cruise on the Rideau Canal was a 26′ drop. Lock 29 has the largest drop on the canal. About 15 minutes after entering the lock, the tall gate at the opposite end of what was now a canyon opened. After a friendly wave to the lock keepers we were off. Sparks was quickly and quietly up to cruising speed. For most of the three-hour tour Ted cruised in the 5–6 knot range, right at the boats hull speed. Sparks seemed to move effortlessly at this speed. The absence of engine noise gives you the feeling it’s being pulled along by magnets, which in a way it is. Although there is a large intimidating electrical panel, the boat’s controls are quite simple: there is the traditional wheel, throttle, bow thruster control, depth gauge and a computer screen. 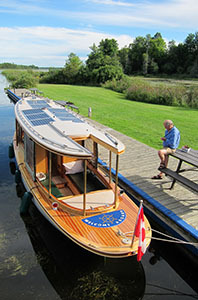 A check of the computer showed that in the few days since they left the boat docked in Smiths Falls, the solar panels had restored the batteries to a full charge. The eight solar modules mounted on the rooftop are designed to recharge the batteries between trips and in a couple sunny days, the battery pack should fully recover from an 80% charge. On a sunny day the panels will put out enough power for the boat to run at 3 knots on solar alone. When running the boat over 3 knots or on cloudy days, the motor will draw from the batteries as needed. The battery pack, consisting of 16 absorbed glass mat (AGM) 12 volt deep-cycle batteries, supplies 48 volts to the 7.5 kW Perm DC motor, which turns the 17″ propeller directly. To preserve battery life, the computer starts the generator when battery capacity gets down to 60%. The water-cooled, one-cylinder Fischer Panda generator puts out 48 volts DC and will power the motor directly with excess power going to recharge the batteries. The batteries contribute considerable weight to the boat’s 6,800 lb displacement, but do provide useful ballast for the narrow (6′ 11″) hull. Jonathan Killing, son of Steve, designed the complicated electrical system, integrating three different power sources and three different storage units with all of the operating systems—propulsion, navigation, lighting, galley and a computer that monitors and records all of the systems data along with GPS data. An elegantly simple touch-screen interface shows the operator the current status of all of the components. It is easy to see which sources are supplying power, where it is going and how much is stored. While underway, the display showed how many kilowatts the motor (a spinning propeller icon) was using and how many of those were coming from the solar panels and how many from batteries. When the boat was stopped, the display showed all power going to the batteries. In addition to the 16 batteries that supply power to the motor, two additional 12 volt batteries supply power—one to the start the generator and one for the bow thruster, lights, navigation equipment, computer and other 12 volt functions. Our cruise ended at Kilmarnock Lock, number 24. At the end of our mostly sunny trip the batteries were still at more than 80% of capacity. No fossil fuels were consumed. Ted and Joan made it to Ottawa and into the Ottawa River then back down to Merrickville where they hauled out the first of September. Sparks went back in the water in Peterborough for some fall cruising until the end of October. Left—The eight Kyocera solar modules on the roof of Sparks, capable of producing 400 watts at 48 volts, are her primary source of power. Right—The Fischer Panda generator will power the motor directly when battery capacity drops below 60%. Excess power will recharge them. This is a different kind of power boating. It’s easy to enjoy quiet conversation and the passing natural beauty of the canal interspersed with pieces of canal history. As you pass through old stone and wooden locks, hear iron pawls clanking on hand-cranked gears and a rush of water though opening valves, you experience what boaters experienced 179 years ago. Cruising on the Bear Mountain 30 Hybrid Electric Launch gives you a taste of what boating may be like in the not too distant future. For more details about the building of the Bear Mountain 30 Hybrid Electric Launch and Ted and Joan’s summer shakedown cruise visit www.bearmountainboats.com. Moores at the helm of Sparks. The classic looking pilot house provides a good view of the passing landscape. 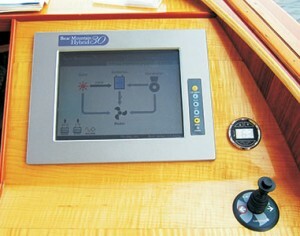 Next to a depth gauge, the computer’s touch-screen interface displays all of the boat’s systems. With the boat stopped, the display shows 200 kW directed to the batteries. Ted Moores relaxes after tying up Sparks for the night at Kilmarnock Lock. While there is daylight, the solar panels will continue to charge the batteries for another day’s travel on the Rideau Canal. To be honest, I had never heard of the Rideau Canal before. Fortunately, Smiths Falls, Ontario, is also home to the Rideau Canal Museum. With a little time to spare before the cruise, we took a quick tour to find out more about the canal. The Rideau Canal is a 125 mile long series of lakes and rivers connected by canals and locks. Completed in 1832, it is the oldest continuously operated canal in North America. It was intended as a military supply route between Kingston and Ottawa in case of another war with the US. It is a National Historic Site of Canada, a Canadian Heritage River and a UNESCO World Heritage Site. The canal was so well engineered that it operates today pretty much as it did when it opened 179 years ago. Closing a gate at Kilmarnock Lock. The swing-bridge over the lock is also hand-operated.